Where’s the pork? New bus shelter to cost 16k per unit! 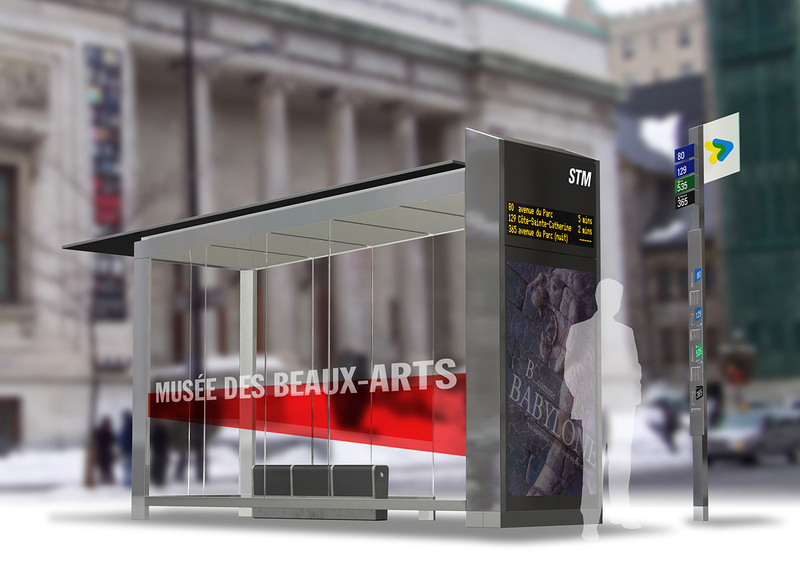 Andy Riga of the Montréal Gazette reports on the STM’s new design for bus-shelters, part of the transit society’s new, and so far successful, branding and design campaign. However, each new bus stop, and the current figure is 400, will cost 14-16 thousand dollars per, with the total project costing somewhere in the area of 14 million. This project is supposed to be implemented by 2013, which means there must be a degree of modularity and/or production-line assembly if they’re to be installed so quickly. The last design cost 6-8 thousand per, though they were admittedly simpler. The new ones are to come complete with motion-sensor lighting, electronic display screens, anti-graffiti treatments and, perhaps best of all, sleek, modern design, worthy of our UNESCO City of Design status. There will be no heating installed, which makes me wonder how these bus stops are as expensive as a small car. Moreover, at prices like this, it makes me think perhaps the cost is inflated, an indication of our province and city’s never-ending problem with getting ripped off by unions, the construction industry, other levels of government, or any combination of the three. Personally, I like the design, and the features of each stop, though for the price I would hope we’d be able to get more than 400 built. Now, if the 14 million dollar price-tag is paying for the project to be completed on-time – that is by 2013 – I’d have to grudgingly accept its probably worth it. But that I’m suspicious of a potential inflated cost and, further, that part of the cost may simply be insurance that the project comes in on-time, reminds me that this city has a problem sustaining development. The list of stalled, delayed, and defunct projects in this city is long and growing, and it ultimately rests with the voting public to insist on self-correction. If not, the paralysis of inertia may swallow us whole. On purely aesthetic grounds though, I have to say well-done. Not outstanding, but superior to what we currently have. Unfortunately, a bus-shelter is hardly an artistic statement, and I think the STM knows that despite the potential for an aesthetic justification of cost. A good friend recently asked me which building here in Montréal tops my list as favourite. 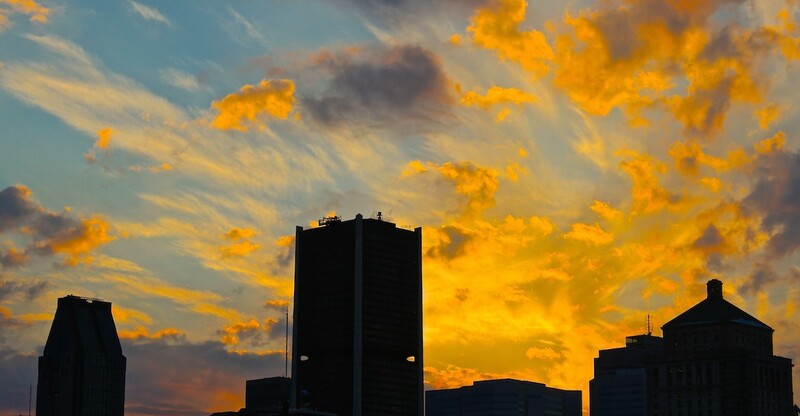 Didn’t take me very long to choose the Sun Life Building, a Montréal landmark sans-pareil. 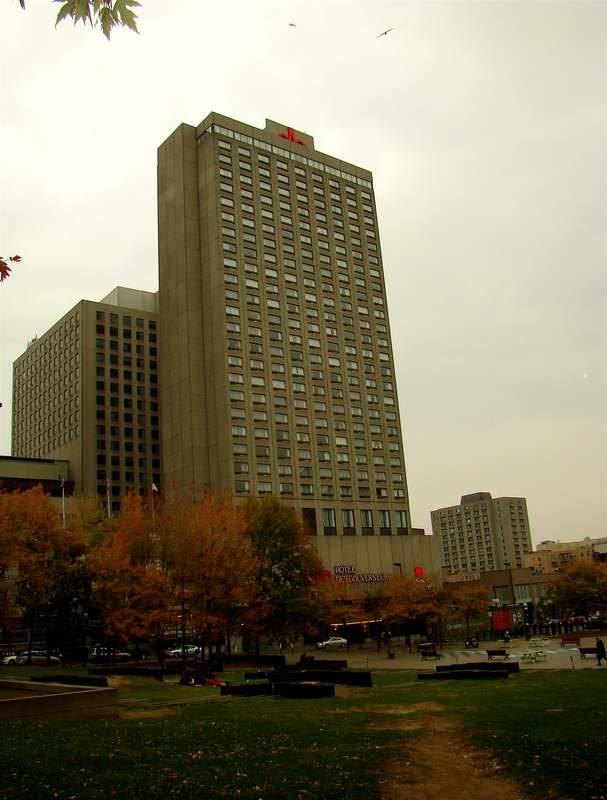 Built over the course of twenty years between 1913 and 1933, the SLB is made of Stanstead Granite, and towers some 26 floors above Dorchester Square in the Central Business District of Montréal. 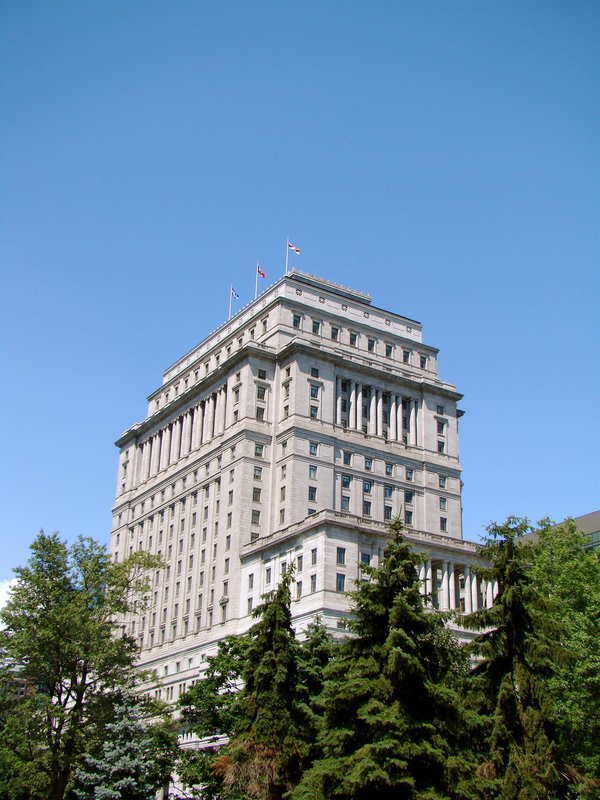 It was, at one point, the tallest and largest building in the British Empire, a title later held by Place Ville-Marie. The building was deemed an ideal location for the storage of the British crown jewels during the Second World War, as it was widely believed the building could sustain significant damage via direct bombing without succumbing. I still hope they were right. The interior was renovated after Sun Life moved out in 1978. A small local office is maintained by the company, which precipitated the ‘Anglo Exodus’ after the passage of Bill 101 in 1978 when they decided to uproot the operation and sail on down the 401 to Toronto. Many other major corporations followed, which only makes the list of major corporations still operating out of Montréal that much more significant (in my opinion). Regardless, the building is still considered to be a major piece of local real estate, and is well used. The building has neo-classical and art-deco elements, providing a well-proportioned monument which maintains an excellent relationship with the square in front of it. Few other buildings in the city are complimented as well – its almost as if the park was made for the building. Starting in December, I believe, a ‘player-celesta’ dating from the very early part of the 20th century, plays sheet music piped outside by speakers, flooding the square below with beautiful music. The last few times I heard it, it was around 5pm, and was preceded by the church bells of St-George’s Anglican. The centre of the city was alive with pleasant music, and all around me I saw the weariness of a long day’s work dissipate just long enough to manifest itself in the form of smiling faces as far as I could see. Came across a very interesting series of drawings on the multitude of proposals for the Balmoral Block and what a new home for the OSM may have looked like. 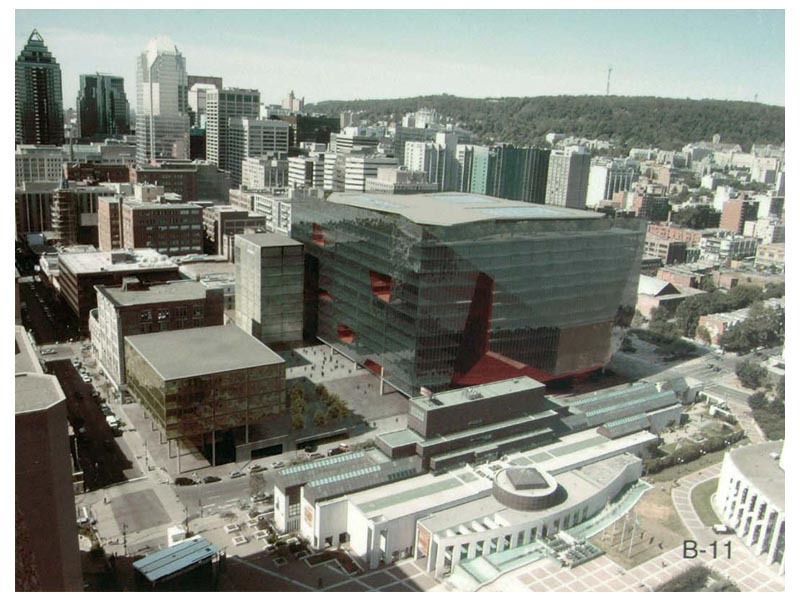 With a new concert hall going up at the Place des Arts, the Balmoral Block is slated for a different kind of development, and a fair bit of what you see in this space has seen recent development. This is an example of how very different a massive piece of the city could have been. Consider it the next time you walk to Place-des-Arts Métro. Still, its always nice to see what could have been. 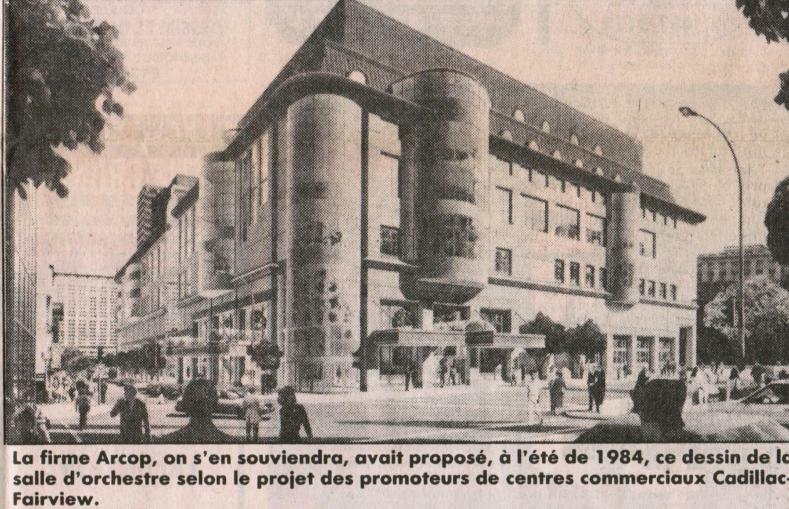 And besides, maybe these ideas will come back – we still don’t have a dedicated Opera Hall yet, and if the Montréal Symphony Orchestra ever makes it back to the level they were playing at in the 1980s and 1990s, we may need an upgrade sooner than we think. Either way – I think we learned our lesson – venue space is priceless. This is worth knowing about. See how different your city could have been? This is the view from the centre of Place Emilie-Gamelin, a major urban square in downtown Montréal directly above the most important Métro station in the whole city, Berri-UQAM. Informally, the area is referred to as Berri Square, though many more simply, dismissively refer to it as Berri, an unavoidable place, very useful, very well connected, but ultimately, undesirable. Berri’s a bit of an anomaly. I like to call it Montréal’s Ellis Island, as it serves as a major transport hub. In the picture you can see the entrance to the city’s main bus terminal, chariot of the poor to all destinations near and far not important enough to have an airport. The bus terminal is small and in dire need of improvement, so a few years back before the economy tanked, the provincial government got involved with a project spearheaded by UQAM and the city to build a massive new bus terminal on the block behind the existing one. It was designed to include student housing for UQAM as well. Once the new station was to be completed, the old one would have been knocked down and replaced with an office tower. I’ve heard this argument, from several people, that there exists a conspiracy to ‘pull’ the downtown away from its ‘traditionally English’ sector to a ‘primarily French’ one. These terms are all very noted, as actual Montréalers know the subtleties of local living – that is, we know the lay of the land. I don’t believe there’s anything sinister about, Berri Square is a natural pole of attraction, and there’s no reason why it shouldn’t be as proud, declarative, and well-respect as Dorchester Square downtown. However, just because it shouldn’t be this way doesn’t explain why it is. Here’s a link to a Le Devoir article concerning the stalled Ilot Voyageur project which is currently a large empty shell of what would have been an impressive building. You can see a construction crane behind the bus station in the top photo. Apparently, talk of not building a connecting Métro tunnel was batted about as a means to cut costs. This is beyond stupid – the current station connects directly! 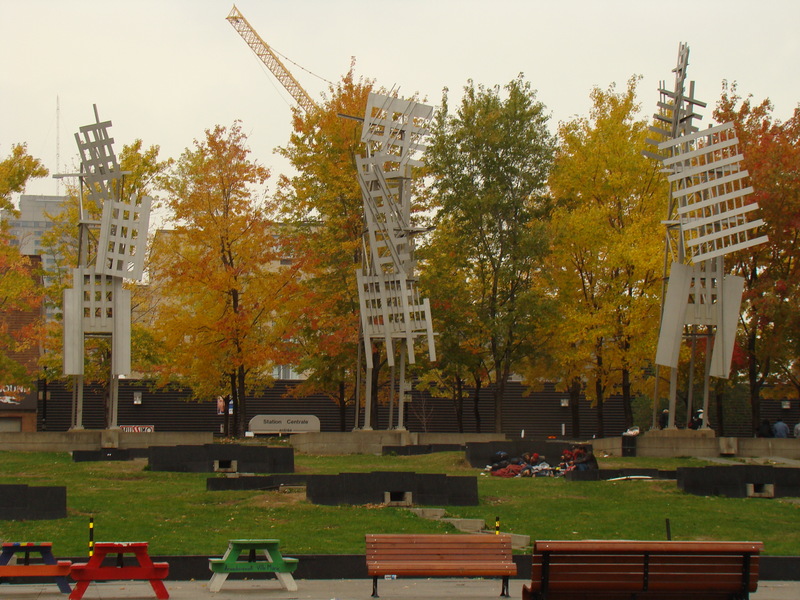 Before the renovation of Berri Square and its transformation into Place Emilie-Gamelin in 1992, several proposals had been floated around about installing a new concert hall for the OSM on the site, but if the Olympics taught us anything, its that you don’t build on public space, you build beside it. – somewhere in the area of thirty to fifty bums, vagrants, drunks, hobos etc, probably getting the best use out of this space presently – everyone else walks around it, few cross. Those who do are either a- very aware of their surroundings, b- completely unaware of their surroundings and for that reason quickly leave or c- in the process of doing, aquiring or selling narcotics.Watch out for a rookie mistake – never buy anything in Berri, never tell anyone to go buy in Berri. You’ll get robbed, or worse. – an urban square so completely disconnected from its surroundings it actually denigrates the value of what’s around it. A total waste of potential – considerations such as: make sure sight-lines can be maintained and ensure the plaza is open and accessible were cast aside for the purposes of an artistic statement. It’s a shame, I don’t know if Charney’s installation will work elsewhere, but its got to go for the sake of this space. When you consider just a vital a space like this, you really wonder why they wanted to stick a concert hall right on top of it. That being said, because of its condition, I’m sure their are many people who would like to see something work here. One more thing, the incomparable Curtis Mayfield is indeed featured on this funkiest of Bran Van tracks, and it would be his last, as the soul-singer-supreme would succumb to illness related to his paralysis. Of note, he recorded the vocals for Astounded while suspended in a special spin-aligning bed. That’s right, Curtis was staring at the floor while his lungs belted out notes that flew towards heaven.